My biggest declutter issue has always been books. I inhale information. I have bookshelves in the bedroom, living room, office and office closet. Not to mention the kids’ bookshelves. When books no longer fit in the shelves I need to get rid of them. 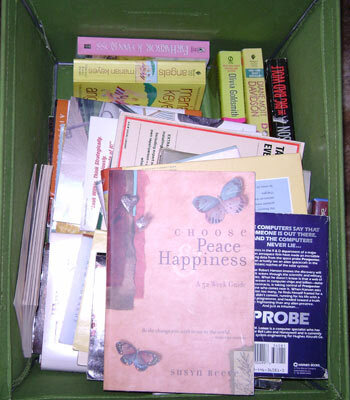 So I decluttered a whole box of books. And hired my son to put them on half.com for me. I am usually pretty good with my magazines. I rarely have any over 2 months old. I love ripping out articles, putting them in my binders or sometimes using them in visual journaling (I don’t draw well yet, so I do a lot of tearing out pictures). 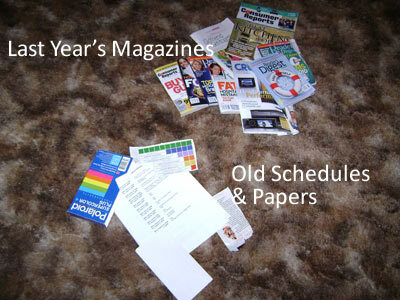 But, magazines we usually keep for about a year are the Consumer Reports and Reader’s Digest Magazines. So today I cleaned out my living room end table and got rid of the old issues. 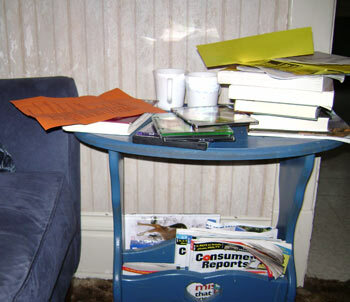 I can’t believe how fast stuff piles up end tables. I was so excited to see all the people wanting to join us for the Declutter Challenge. 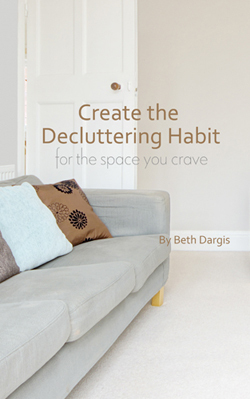 Decluttering is a way to take control of your home, instead of your home controlling you. My Day 1 decluttering challenge came on me by accident. I was looking through my shorts and decided to straighten out my drawers. I found a pair of shorts that I had for years. 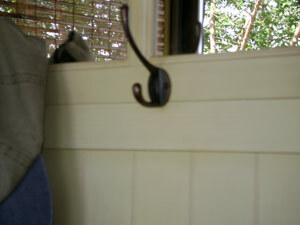 Faded denim and green paint from when I painted the kitchen cabinets sage in 1999. "But, I can’t get rid of them. They are so comfortable," I told myself. Then I pictured how I looked in them. The stains. The stringy bottom hem. Why would I want to put these things on my body again? Out of the drawer I threw the shorts. 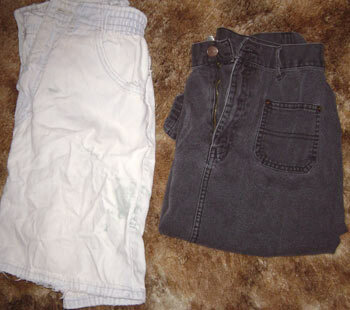 As I sorted the rest of the shorts I found a faded black denim skirt. It doesn’t even look black. I tried to talk myself into keeping it – after all this skirt was comfortable too. But, the color on it was so sad and the hem was coming loose. I suppose I could dye it and sew it, but truthfully it was probably a $5 skirt. And I have a cute, black skirt that is actually black. When it’s back to school time, I always get the urge to declutter and re-organize. This year, I’d love to have you join me and my friend Marcia, who thought the idea up. 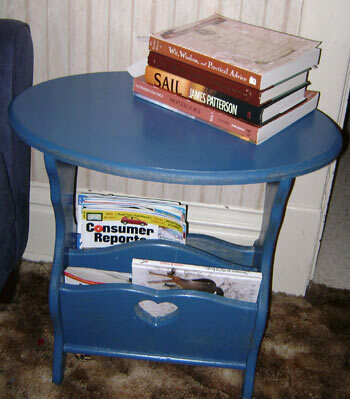 Marcia and I will be posting at our blogs every day with what we have decluttered. The idea is to declutter at least one item a day for the entire month. If you can’t commit to an entire month, then commit to at least 7 days of decluttering. Then every Friday starting 8th August everyone who’s participated for the previous 7 days writes a post on their own blog with their pictures and links that post to the Mr Linky on my blog to get their entry in. I am donating a Simplicity ecourse every week and Marcia is giving away a Household Organising File and a Christmas Planner every week. So there are 3 chances to win something clutter-free to reward you for decluttering your home. You may only link up if you’ve done 7 days of decluttering and written a post with the 7 items. So the more you declutter, the more chances you have to win. 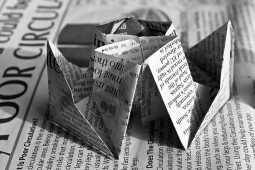 It’s win-win-win (less clutter) whether you win a prize or not. And then, at the end of the month, I’ll put up another Mr Linky and one person will win one of my bestselling Organise your Home ecourses. If you don’t have a blog, you can participate by posting on our Friday posts with your 7 day accomplishments. Let’s see how much decluttering we can get done this August! Ready to join us? This time of year makes me want to take off the heavy possessions of last season. Piles of books in my office become stifling. I put them away and sell others to create more space for air to flow. Bulky sweaters are put into storage making ample room for light, airy dresses and short sleeved shirts. Dark blankets are stored, leaving only one wispy cream blanket for cool evenings. Most of the knickknacks are put in the basement for the next few months. Even the fruit bowl, usually in the center of the table, is gone to preserve the fruit longer. A small wooden box for garden supplies replaces the boots, backpacks and gloves from the porch. I love the breathing space which rewards my work. And maybe by fall some things will stay gone for good. Yesterday after finding clothes everywhere in my son’s room, I knew it was time to declutter. I was in the advisory position. I know better than to try to get rid of a 15 year old boy’s stuff. First we went through his clothes. He has outgrown so many this year that a huge garbage bag was filled to take to charity. Much was barely used since he grew so fast. We found clothes under the bed, in the closet, clean clothes in the hamper, dirty clothes on the floor. Too many clothes! Now it all fits into his dresser again. Near the closet we uncovered his trash can, so he went around throwing out all the garbage. Then found we needed a big garbage bag instead. The dressers didn’t get as cleared as I would prefer. He got rid of the green stretchy frog, a few cars and put change into the wooden and glass piggy bank. But, left the rubber band ball, his broken karate trophy and numerous Kinex creations. After the dressers got a good dusting, it was time for the books. He loves books as much as I do so they were under his bed, in stacks on the floor throughout the room and on every horizontal surface. He decluttered some of his least favorite books so the books were all able to fit in the bookshelf. And we decided he could keep the books he was reading on his headboard shelf. This is also where he put all his PSP paraphernalia. Papers and memorabilia got thrown out or put in their boxes – a file box for papers and a plastic box for memories. These are stored at the end of his bed next to the trash can. He had an empty file box that we are going to give away. He filed all his notes that were piled on his desk and I got him a notepad so he doesn’t need to use scraps of paper. The computer games were put back into their cases. His pencils and pens went back into his little plastic desk drawers. He took off the decorations on top of his desk and gave it a good dusting as he chatted with his friends. Things were gathered and put where they belong from around his desk. Then the final go around the room, we went from the door all the way around. He got rid of any other floor piles, garbage or clutter. He took out the garbage and I have a huge couple of bags to give away. Much better! 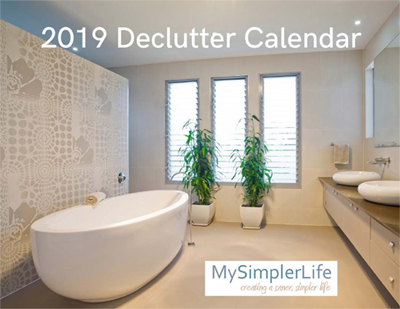 I have ran across various places where people are playing with the Declutter Calendar and checking in with each other. I was wondering if there was an interest in me setting up a message board for people to check in with their decluttering and have group accountability? If this sounds like something you would like, please post in the comments below. One person is my Declutter Group asked why the kitchen is such a difficult place to declutter. Things get moved from spot to spot, but not decluttered. The kitchen is the hearth of the home, the nurturing spot. I think many of us have ideas how we will nurture our families and friends with homemade breads, fresh squeezed juice and delicious fancy meals. But, most of us never get to it. So letting go in the kitchen means letting go of certain aspects you have of yourself in this nurturing role. Also it means letting go of certain plans and projects. You have to be willing to ask yourself if you have used this and if you will use it in the future. As you are putting the kitchen item into your decluttering pile you can think thoughts that make you feel free of another expectation you put upon yourself. You get to redefine what it means to be a good nurturer. Another help if you can’t get rid of the items yet, is to take everything out of the kitchen you haven’t used in the past month and put them in a box in the basement. If you need one of the items you can go downstairs and get it. Then if items are still in the box after 3-12 months you can get rid of the whole box at once. Holiday items like the turkey roaster are best kept in storage, not in the kitchen anyway. One drawer, one cabinet at a time. You can do it! Today I decluttered the bathroom cabinet with our grooming supplies. The first thing I went through was my make-up. I realized some of the eye shadow was a few years old. And out went the lipsticks that were never my color. Old powders I threw out. I always use up my mascara before the 3 months is up, so that’s usually not a problem. Next I sorted the remaining cosmetics by color in my plastic cosmetic sorter – roses and purples on one side, browns and greens on the other. I stick to these colors so I don’t have too much makeup for my container. The summer bronzers and foundations I put in a little plastic basket towards the back of the cabinet. My shavers and nail files went into a cosmetic bag I got free with a magazine subscription. Any free samples went into another cosmetic bag. Finally I got a bigger container with a lid for my hair doodads. My new head bands didn’t fit into the smaller basket. It’s a pain to have hair stuff tumbling out. And with a lid, I don’t have to worry about them getting makeup or toothpaste on them. I stood there a minute to enjoy the view. Tomorrow it will be much easier to get ready. But for most things in bathroom drawers and cabinets, baskets, shoe boxes, cosmetic bags and desk accessories work just fine.